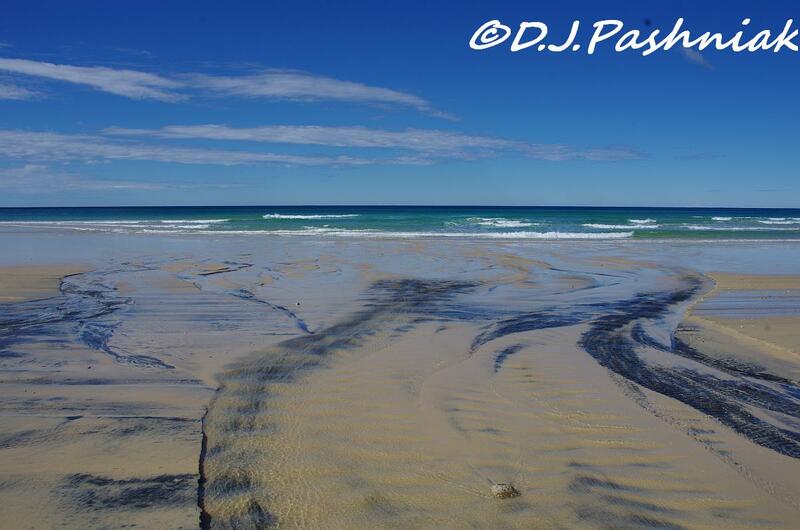 This is where the Freshwater Track comes out on the beach. Looking north towards Double Island Point the clouds that were so threatening in the early morning were disappearing eastward. 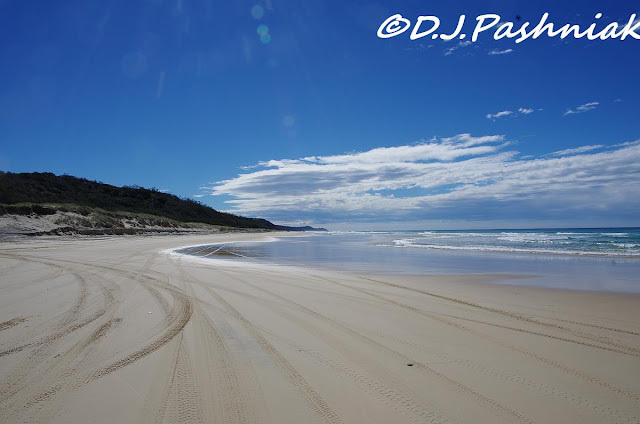 Looking south the beach stretches all the way down to Noosa. Even at this season - which is early winter here in the southern hemisphere- there were vehicles all down the beach. I really enjoyed driving down the beach. With the windows down the sound of the ocean is so close and the breeze is fresh and salty. It's a long time since I have driven like this right beside the sea. As a young child we lived in the far north of New Zealand. Back then, there were a number of places where the only road was the beach. 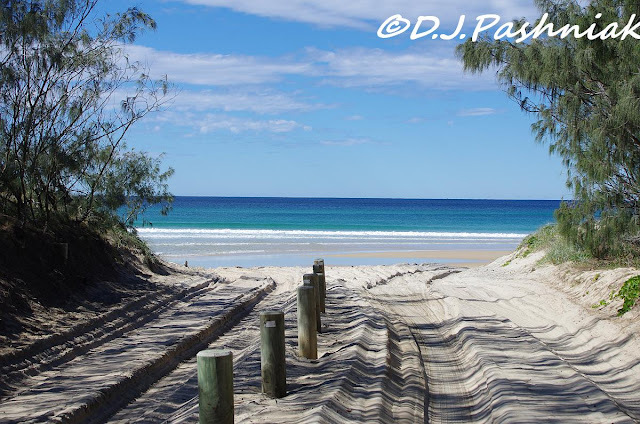 This beach from Noosa up to Rainbow Beach and along to Inskip Point has been used for driving along for many many years. Locals and tourists alike would vehemently protect their right to continue driving along it. I enjoyed it - but - I also know that sand compacted by many vehicles does not contain the same amount of little creatures. There were 50kph signs prominently displayed at intervals down the beach. There have been a number of deaths on the beach when drivers have hit wash-outs before they could slow down. 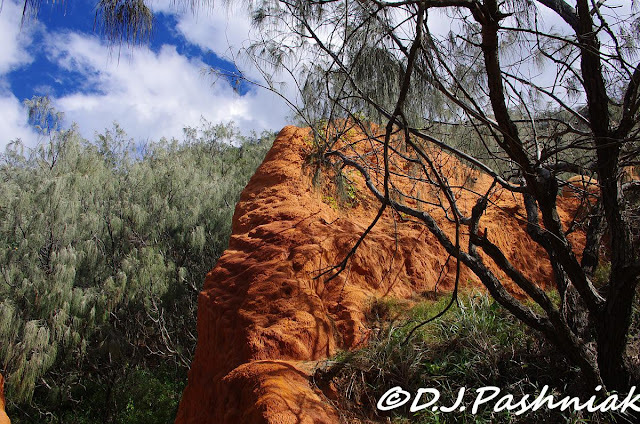 I saw small streams seeping out from the sand cliffs all the way along the beach. 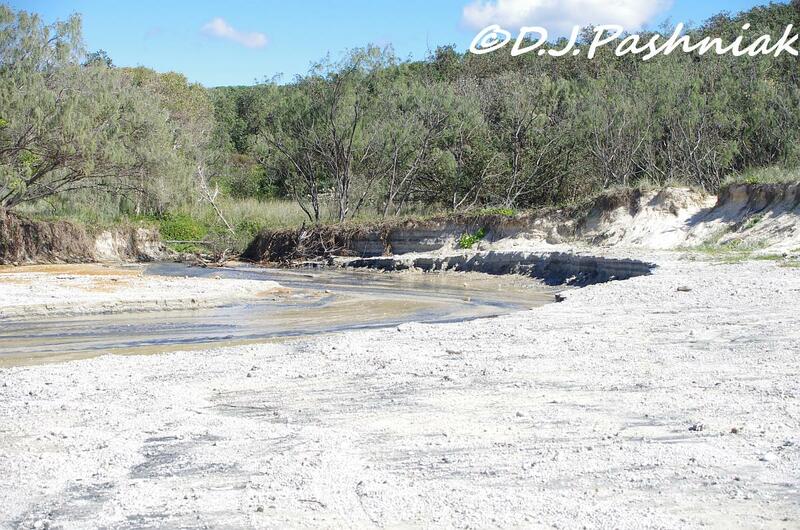 There is a huge amount of water in the water-table below ground level in much of the Park. 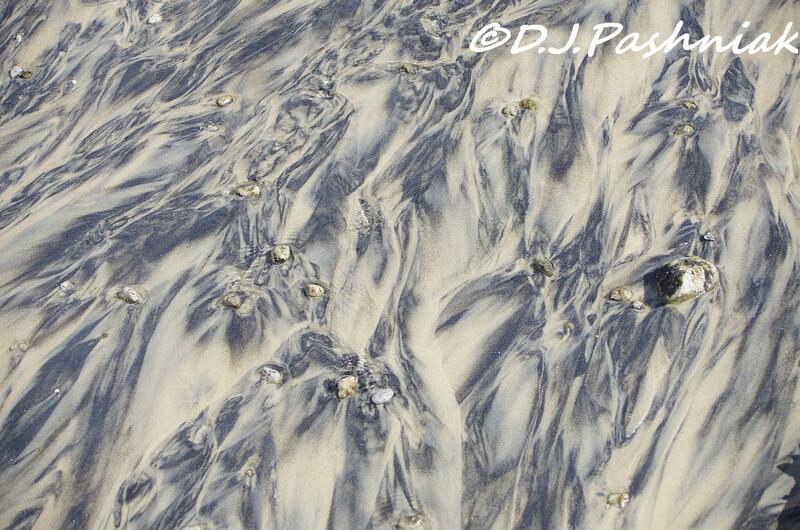 The darker mineral sands left patterns as the fresh water washed towards the ocean. 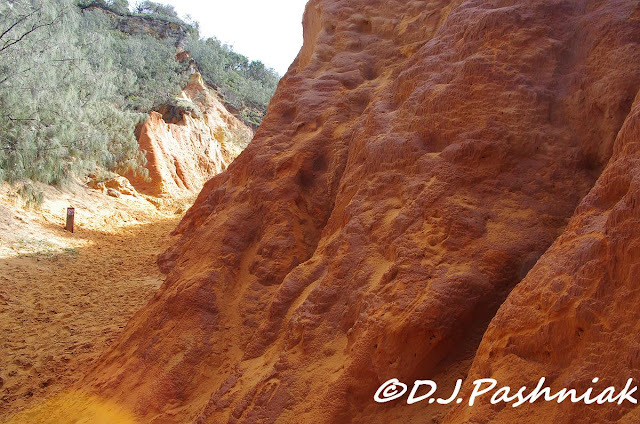 There are different colors of sand in the cliffs above the beach and my friends wanted me to see the place called Red Canyon. This is just above the beach and so different from what is around it. 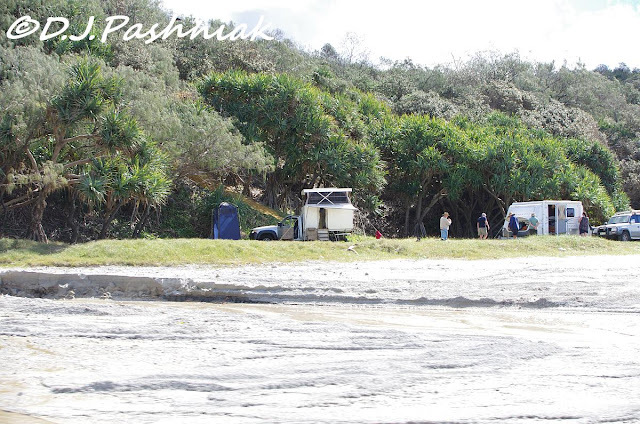 Camping is permitted in most places beside the beach. However, you must bring everything you need to keep your environment clean. I was surprised at the number of campers we saw - but was told that in the summer there are camps and vans side by side all along the beach! Many of the campers were there for the fishing. Wherever there are people fishing you can be sure there will be Gulls hoping for a quick and easy feed. These are Silver Gulls. I did not want to stop for close photos of Silver Gulls - they are common! So I went back in to my photo archives for these. The second photo shows an adult and juvenile with the juvenile hunched over and begging! I also saw a few Terns flying low over the water. Apart from these, this is not a beach suitable for shorebirds. The beach appears to shelve quite quickly and deeply. Also the tide comes right up to the edge of the sand-hills so there are no places for roosting birds. Shorebirds much prefer the still waters of the bay and the great expanses of sand and mud where they find food at low tide. Once again thanks to Sarah and Graham for such a great day! driving on the beach would be neat, but it does look rough in places. such pretty colors! Love the deserted beach and how cool to be able to drive along listening to the waves breaking on the shore. Driving on the beach isn't allowed in Oregon and we were surprised when we traveled and found out that is was OK in many places. I never quite got used to it.. seems like beaches should be more pristine, but that's just Oregon talking! People are really taking advantage of this National Park...I like that camping is allowed! Lovely photos from your visit to the beach. The second shot with the sky and beach is my favorite, just gorgeous. Thanks for sharing your world, great shots! lovely views - it looks like you had a wonderful time along the beach, and it looks like it was perfect weather. Have a wonderful week. I am linking up to you through Our World Tuesday. I had to giggle at the divided 'highway' onto the beach! Painted sands like that I also remember from New Zealand. 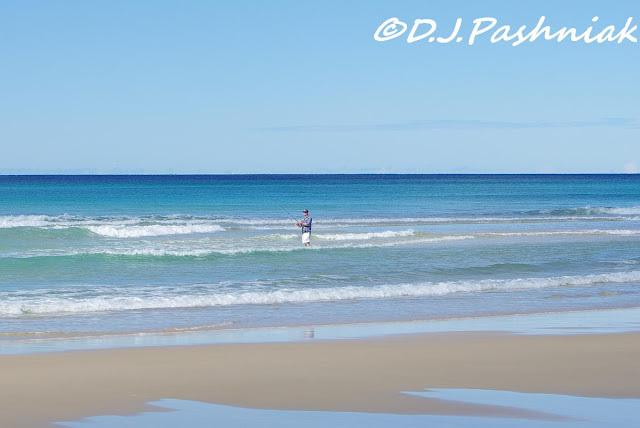 I so love this beach, i saw fish swimming in those clear waves as they came in. A lovely post Mick. Oh my - how very very beautiful! 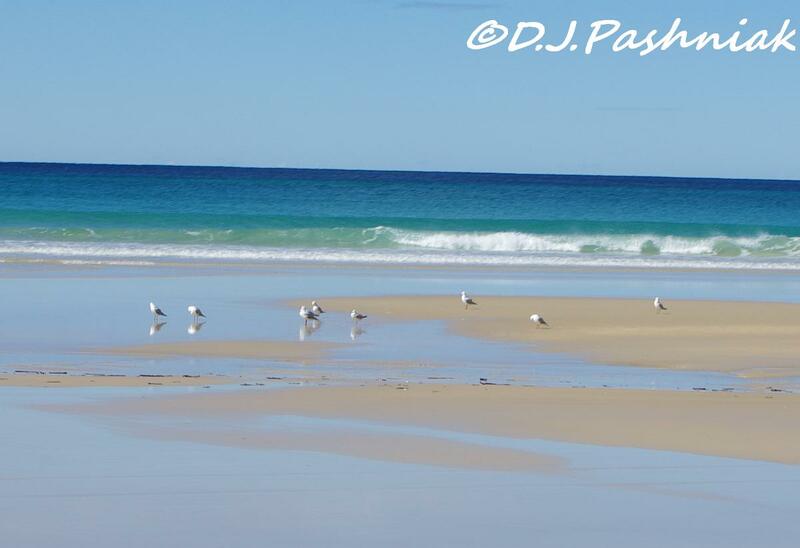 Great pictures of your environment and of course of the gulls! I would go here at the drop of a hat!! And to share this wonderment with great birds just would make my day complete. Great images of the gulls. That is some gorgeous scenery, Mick! Beautiful shots! What a beautiful beach. I prefer "winter" camping in Australia. It's so much cooler and many of the places are deserted! 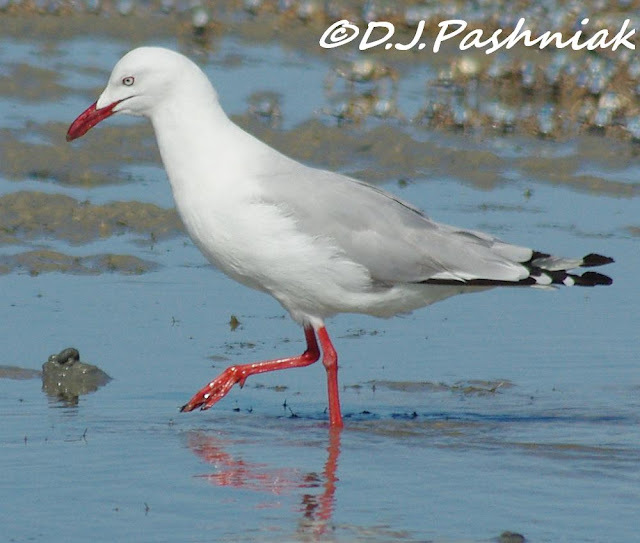 I like the gulls with their matching beak and leg colour. A great serie of photos, perfect for WBW! What a stunning part of the world you live in... Fantastic images of a beautiful landscape. What a great location to visit. What an awsome beach, how lucky are you Mick. 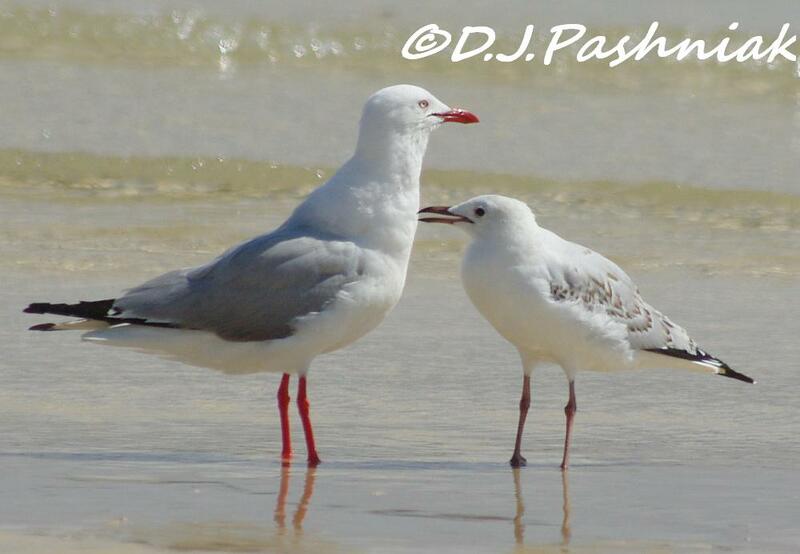 Beautiful shots of such a lovely looking beach, silver gulls are common but they are beautiful. Sandy National Park looks like a great place to drive as well as spot birds. I'm pleased you chose to show us Silver Gulls Mick. The only time I see them is watching the cricket on Sky Sports! They have beautiful red legs - an amazing shade. 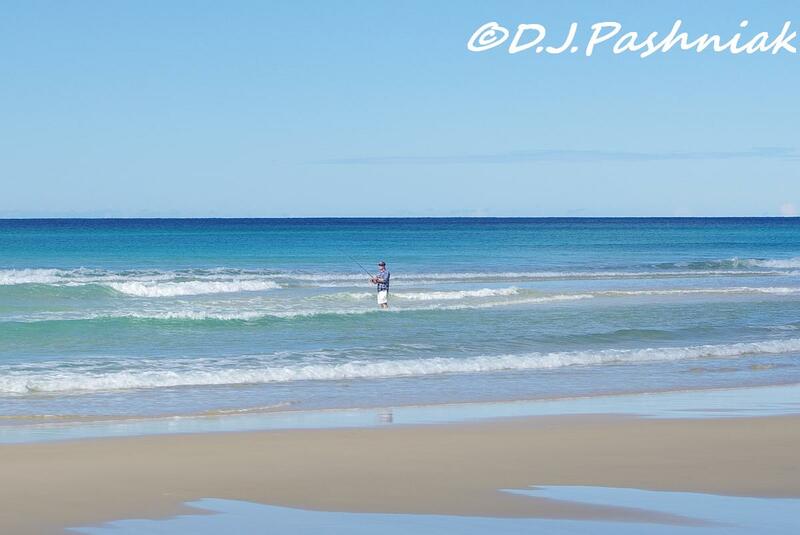 Great looking place - your are correct when you say that you are rarely alone if you go fishing! I was stood on top of a slope that put me on eye level with the silvereyes - otherwise I would have hde no chance to get the images. 'must get there some day! I guess I've seen it several times looking north from the Noosa headland! Interesting ride! i learned the hard way not to drive on the dry sand, miles from the nearest road. That first shot has to be a shot of paradise! Wow! Terrific shots of the gulls! Beautiful shots, Mick. I'd love to be there. Gorgeous beach full of color contrast! Looks like a lot of fun to hike and explore. A little paradise. Thanks for sharing the Silver Gulls. Another one to add to the list. Sorry to be negative, but what do all those campers use for toilets? A lovely place, thanks for the article. I noticed sullage pits at the Freshwater camp and picnic area. I would assume individual use of "porta potty" type toilets. I haven't camped in a place like that for years but good camping practice has always meant "leave no trace"! That beach seems togo on forever. I would love to walk and explore that coastline. More gorgeous images!! I love the white sand of the QLD beaches! 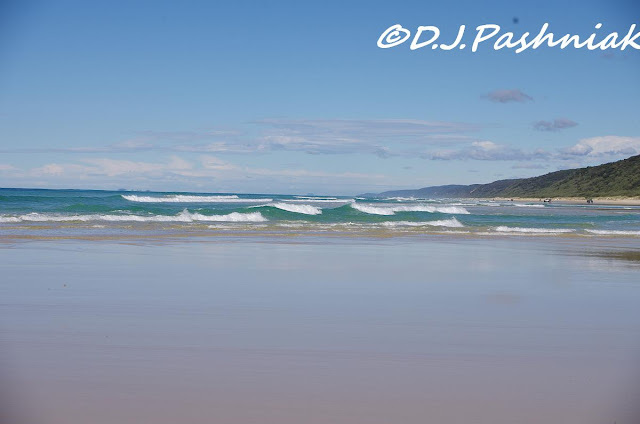 I've only ever driven on the beach once and that was on Stradbroke Island with my parents about 10 years ago when they brought their $WD up from Melbourne. I also did the Coloured Sands Tour as a 10 year old in a 4WD bus.